Dura Vermeer is one of the top 6 firms in the Dutch construction industry. An independent family company since 1855, Dura Vermeer has been active in development, realisation, maintenance and engineering for construction projects in housing, utilities, industrial sites and infrastructure. Dura Vermeer take an innovative approach to the projects that they develop, manage and deliver at their own risk. They work with third parties and partners to provide trendsetting, integrated and sustainable solutions to overcome a wide range of construction challenges. The municipality of Hengelo in the Netherlands ssued a tender for the replacement of the Boekelose Bridge across the Twente Canal in Hengelo, with the province Overijssel as its biggest subsidiser. The award criteria was innovation, architectural and aesthetic quality, and realisation time based on MEAT. To meet the innovation criteria, Dura Vermeer entered into a partnership with Recreate. Recreate provides solutions based on Virtual Reality, Augmented Reality and Mixed Reality that provide added value to companies. 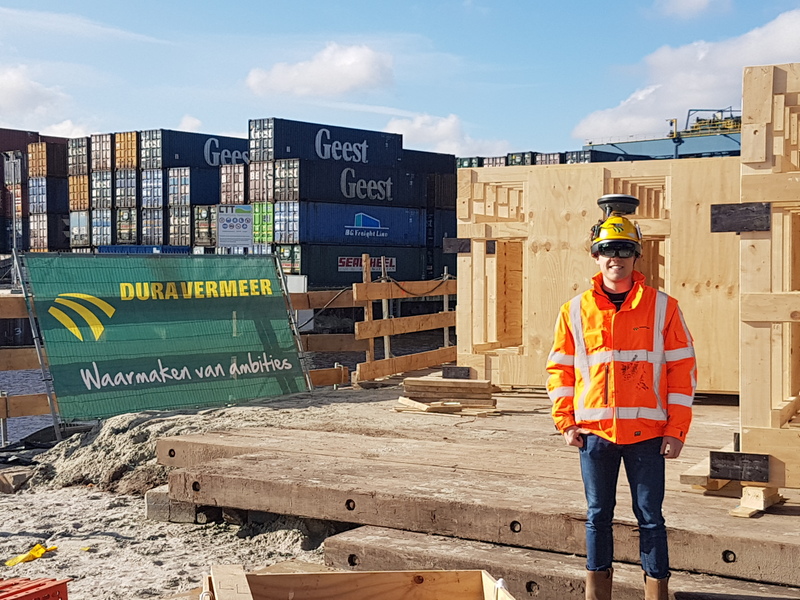 The future bridge will be the connecting link between the city of Hengelo and the industry situated alongside the Twente Canal. The bridge was designed completely in 3D. Using the EBMR solution, the bridge design was placed over the ‘real world’ as a layer. EMBR is unique technology developed by Recreate in which a 3D model, a real-time holographic display of e.g. an architectural plan or blueprint, is placed over the user’s view of the construction site by using a Microsoft HoloLens. ‘When you are at an empty construction site, the contractor can see the structure of the object to be built, correctly positioned, as if it has already been constructed. When the user moves, his view of the structure also moves along with him. The user no longer has to imagine what the building will look like based on a good grasp of the drawings,’ André van der Vegt indicates. The contractor now has a clear overview of the entire design instead of just a part of the drawing. By making the 3D model visible using the Microsoft HoloLens, deviations and mistakes are spotted at an earlier stage, which will help Dura Vermeer achieve higher returns on projects. During the assessment phase, it became clear that the tender submitted by Dura Vermeer had a much more added value than the other bids. The evaluation price was the tender price minus the calculated added value. Of the five parties that submitted a tender, Dura Vermeer turned out to have the most economically advantageous tender (MEAT). Since the construction process will be extremely accurate, Dura Vermeer will save costs on monitoring the implementation and will reduce costs of failure. This will result in increased added value. Dura Vermeer is using EMBR and the Microsoft HoloLens successfully on two other projects.